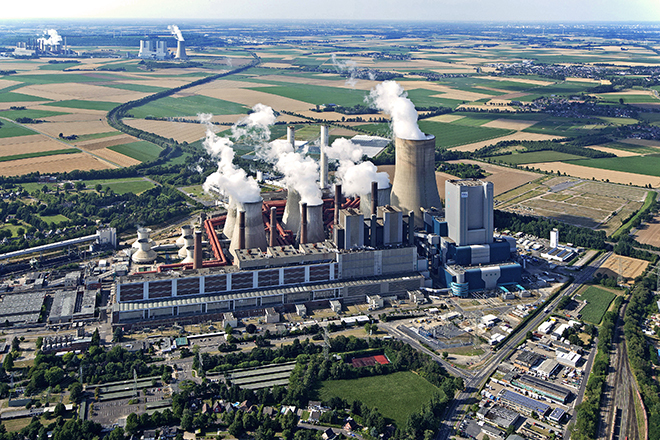 Utility RWE's lignite-fired power plant in Niederaussem, the second-largest in Germany. As Germany's closely watched coal exit commission drafts its blueprint for how the world's fourth-largest economy should wean itself off the fossil fuel, the country's biggest power generators stand ready to fight if they see their financial interests are bulldozed in the race to decarbonize the electricity sector. The commission's recommendations for an exit from coal were originally due in November but have been delayed until the end of this month, highlighting the complexity of the issues at stake as industry representatives, environmentalists, trade unions and other stakeholders negotiate an end date for coal power plants and structural measures to soften the economic blow of the phaseout to Germany's three lignite mining regions. In a bid to speed up the commission's efforts, Chancellor Angela Merkel this month met with federal ministers, state premiers and the heads of the commission, which reportedly resulted in promises of billions in structural investments and direct financial help for the states most affected by the phaseout. "The commission has already said clearly that they don't want to see any socially unacceptable layoffs [connected to coal] and that definitely comes at a cost," Markus Krebber, CFO at RWE, told analysts on a call to discuss the company's third-quarter earnings in November. "If there is a clear interference with existing legislation and company assumptions on investments, then that should also come with compensation," Krebber said. But moving fast on the phaseout, especially of lignite, is seen as key for Germany to reach ambitious EU-wide emissions reduction goals for 2030. "Even with accelerated renewable additions and coal closures, Germany will likely achieve its 2030 decarbonization targets with a two- to four-year delay partly due to headwinds from the nuclear exit in the early 2020s," said Deepa Venkateswaran, a senior analyst at Alliance Bernstein. Yet Venkateswaran expects the commission to be pragmatic and set an end date for the mid- to late 2030s since any earlier would be too harsh for the lignite mining regions and endanger security of supply. "Phasing out 51% of the [electricity] mix is not a trivial challenge," she said, referring to the output from both coal and nuclear plants last year. A draft report by the commission, seen by Reuters, suggested that compensation for operators should be based on payments made in similar cases in the past. The report is likely to reference an existing strategic reserve for lignite plants in Germany, which paid around €600 million per gigawatt to operators for idling their plants for several years before decommissioning, the newswire reported Jan. 23, sending RWE's share price higher. Environmental groups slammed the commission for focussing too heavily on paying off coal companies as well as the structural transition for affected regions. Energy minister Peter Altmaier also said he plans to compensate industry if power prices rise as a result of the coal exit. "The coal commission is making headway everywhere, but not with climate protection," Michael Schäfer, head of energy policy at WWF Germany, said in a statement. Analysts at Bernstein say it will be "critical" for RWE to get compensated for any early closures to defray the costs of shutting down the plants and any lost earnings. RWE's fleet of coal plants is the oldest in Germany, with a capacity-weighted average age of above 31 years, according to data compiled by S&P Global Market Intelligence. In addition, the vast majority of its plants are located in the western state of North Rhine-Westphalia, which is seen as more resilient than coal mining states in the eastern part of the country and therefore a likely target for earlier closures. "The conditions in western Germany are a lot better. It's basically prime real estate, in one of the most economically sound regions in Europe," Pieter de Pous, senior policy adviser at climate think tank E3G in Berlin, said in an interview. "That's very different in Lusatia," a poorer region where it makes sense to have a longer transition period, he said. 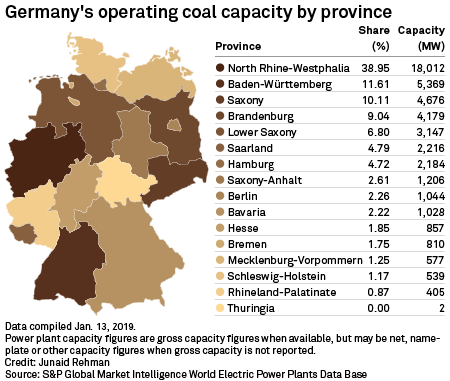 Eastern states, such as Saxony and Brandenburg, are home to many newer coal plants as well, which would be in line for higher payments if they had to come offline sooner. Companies with a majority of coal assets in the region include the second-biggest operator, Czech Energeticky a Prumyslovy Holding a.s. The company, which bought a large portfolio of eastern German coal mines and lignite-fired power stations from Sweden's Vattenfall AB in 2016, operates plants with an average capacity-weighted age of 28 years. 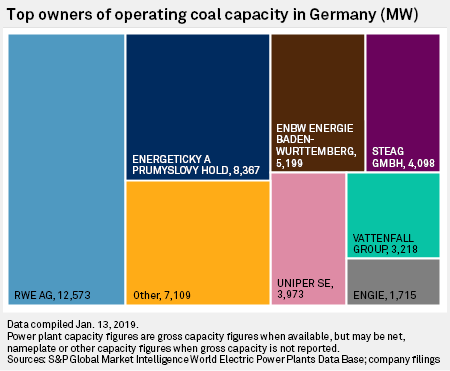 The largest coal plant operators in Germany also include EnBW Energie Baden-Württemberg AG, STEAG GmbH and Uniper SE, the former E.ON SE subsidiary that was sold to Finland's Fortum Oyj last year. Uniper CFO Christopher Delbrück told analysts in November that, given the government's ambition of short-term closures "with almost no ability for the plants to adapt and for employees to adapt," the company would expect at least some form of compensation. Delbrück specifically referred to Germany's lignite plant reserve as one option. Although the federal government will have to deal with hefty financial requests already — the four states most reliant on coal mining have asked for up to €60 billion — it is seen as unlikely to force a confrontation with coal operators, who are likely to sue if they do not get their way. "The government is keen to avoid another case as they have now with the nuclear phaseout," said de Pous, adding that Berlin may find itself stuck between a rock and a hard place if the commission does not come to an agreement. The government is expected to closely follow the coal commission's findings when it eventually enforces an exit. "The more consensual the decision [by the commission] is, the more likely it is to just sail through the government and parliament afterwards," de Pous said. A study by environmental lawyers at the non-profit organization Client Earth released in December recommended that rather than making bilateral deals with coal generators, the government should seek to pass a law to mandate the coal plant closures, which should be staggered by either plants' age or their emissions. This approach would ensure a strict legal framework for compensating plant owners and avoid shifting any control over the phaseout, even partly, "into the sphere of the operators," the study recommended.